Our priority at pro.NET Communications is customer service and ensuring we satisfy all of our clients Internet needs. Our experience allows us to solve problems and tailor them to your company. 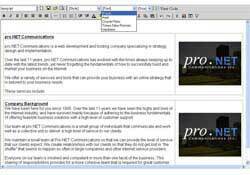 Therefore; pro.NET Communications has no pre set generic web packages. Get an understanding of what you want to do on the Internet. Build a strategy based upon your needs and our experiences. Design the plan to succeed. Then implement the plan and evaluate our success. Once the project is finished we maintain our relationship and work together towards future goals.